On Thursday May 19,2005 Downtown Crystal Lake / Main Street is having a very special cruise night. We are have American English, a Beatles style band playing from the roof top of the Raue Center. This cruise is going to be limited to English made cars only. Car owners and clubs are asked to call to reserve a parking space. Looks like a pretty cool evening. Anyone interested in attending, please post here so we see how big a group we get!! 03/13/2005 Note: I was told that Millie's does not take credit cards, so be sure to be ready with cash money for breakfast..
Come on out for an early spring drive to Millie's Resturaunt in Delavan Wisconsin on Sunday March 20th. WHERE: Starting at the Starbucks at the Village Square in Northbrook, ending in Wisconsin. WHAT: We will be taking the slow twisty way out to Lake Delavan, and enjoying some of the scenery and back roads of northern Illinois and southern Wisconsin. After a stop for a late breakfast, we will continue on towards Lake Geneva for a loop through the famed Snake Road, and then home or exploring on your own. This is a re-run of a ride we did a couple of years ago before we were officially a club. Hopefully the weather will be a bit warmer than last time, but you never can tell on our Spring Drives. Bring along your best MINI Clothes, an FRS radio if you have one, and a smile. This will be a longer drive, so be prepared. 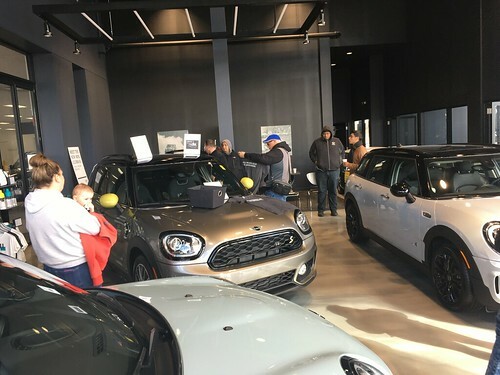 Wrapup: Nine MINI's braved the drizzle and crazy Lake Shore drive traffic to head down to the Auto Show. Cruising down in tight formation drew a fair amount of attention. Huge thanks to Knauz for providing a last minute handfull of free tickets to the show!! Come on out for a nice morning drive, even if you don't want to attend the Auto Show..
Post here if you are interested. Keep an eye on this post for updates during the week! It is with regret that we announce there will be no pre-show Chicago Auto show event this year. MINIUSA tried to get us the same time slot as last year but the company running the Auto Show was not responsive to their requests. We'll certainly be trying again next year! If there is enough interest we could however, meet at the show before opening on the first Sunday (2/13). Possibly even with a short drive downtown before hand. Comment below if you're interested. A few weeks ago several of us got together and formed a team to participate at the Chicago Indoor Racing Team Endurance race on 2/27. If there are other club members interested in taking part in the race I'd urge you to get your team together (feel free to use the comments section here) and register as soon as you can. For more info on Team Endurance Races check out the CIR here.